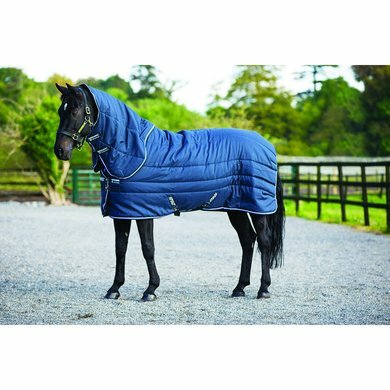 The Amigo stable blanket Vari-Layer Plus Heavy is a 450g stable rug made from a durable 600D polyester exterior and smooth polyester lining. The blanket uses the Vari-Layer technology, this technology uses extra layers of thermo-bonded fiber padding over the back and hip for the ultimate retention of warmth and comfort, but without extra weight. The blanket has a classic model with a double hook / eye chest closure, cross surcingles under the belly and a buttock. 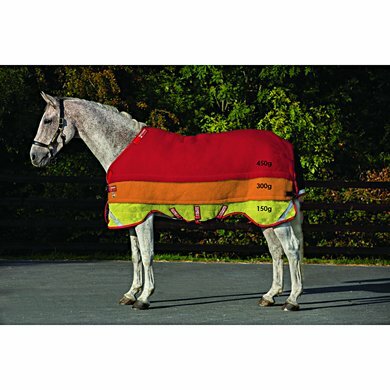 The blanket has a detachable neck and the blanket has the Horseware linersystem. This blanket is certainly a buy recommendation. Super fit in the usual Horseware quality. Question: Is the neck also detachable? And how many grams is the blanket? Answer: On the back the blanket is 450 grams, the layer underneath 300 grams and along the bottom edge the blanket has 150 grams filling. The neck is removable.